The third of the five key attributes to a happily managed community is thorough and regular site maintenance. As spring gets into full bloom, maintenance crews and landscapers are out in full force repairing damage from the last several months. I once lived in an apartment building where the owner took preventive maintenance to an extreme – painting, improving and investing in the building well before it was necessary. The lounge area was completely renovated years before it actually needed to be redone. The rent wasn’t low, but I witnessed weekly something being improved. And for me, it was worth the slightly higher rent payments to live in a clean, safe, well-lit and maintained property. For planned communities, taking care of the little problems while they’re small is the best and most responsible way a Board can use the community’s money to keep the property from looking tired and getting run down. Although decisions aren’t easy when it comes to spending community money, especially when special assessments are required, the Board, with help and counsel from its management company, must make those decisions to keep property desirable for existing and future owners. 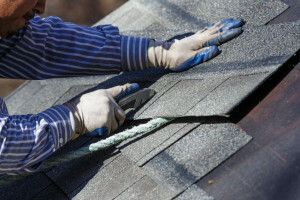 In order to fit properly shingles are cut. Some communities are simple – single family homes with just landscaping maintenance, so there are no questions about keeping the property well-groomed; but other projects are lot more complicated when maintenance is more extensive, and expensive. However, letting these maintenance jobs linger is far worse. Sterling keeps abreast of maintenance needs by doing regular site checks, by having good working relationships with contractors who alert our team to issues, and by working with the Board to plan for those projects that will take more of the community’s resources. Sometimes it’s not easy making decisions to replace things like roofs, decks or siding, but in the long run, the community’s needs must come first and foremost. Posted May 3, 2016 & filed under Property Management Insights.